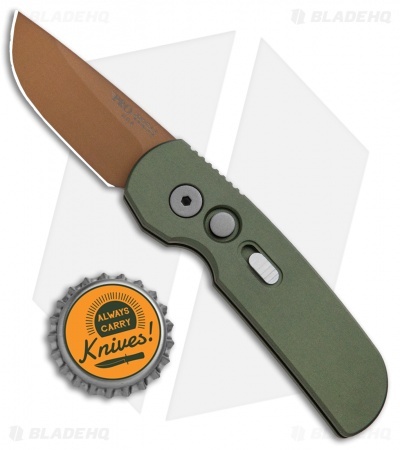 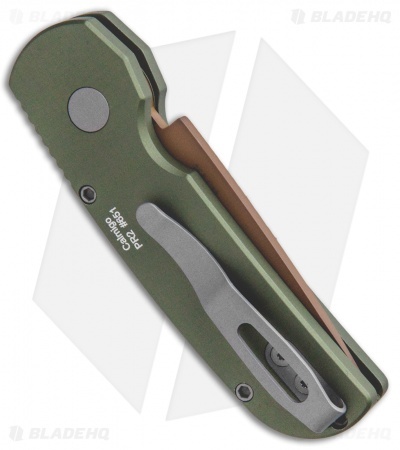 This Calmigo model Desert Warrior edition features a stout CA legal drop point blade with a copper finish and an OD green anodized aluminum handle. The Protech Calmigo is a compact automatic knife geared toward everyday carry and general utility. Its aluminum handle has jimping on the spine, paired with a shallow finger groove, to provide ample grip and precise control over the blade. The Calmigo is fitted with a sliding safety lock and a deep carry pocket clip, making it a comfortable and secure EDC option. CA legal 154CM blade offers great wear resistance and cutting performance. 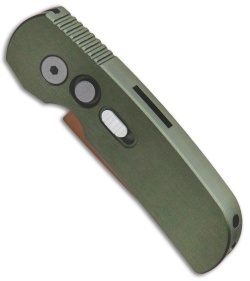 Fast-action automatic blade deployment at the press of a button. Sliding safety lock and a deep carry pocket clip for everyday carry.